BRYAN EATON/Staff photo. Lt. 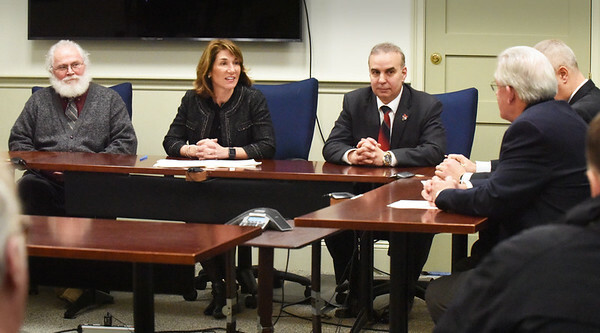 Governor Karen Polito was in Georgetown to sign Georgetown’s Second Community Compact with the Governor’s Office. The Town is the recipient of a grant contract for $10,000 for the costs associated with deploying an open check book /budget transparency program. Clockwise from left, selectman Gary Fowler; Polito; state Rep. Lenny Mirra; selectman Joseph Bonavita and town administator Michael Farrell. State Sen. Bruce Tarr is out of view.